All R.C. Allen instruments have a one year warranty from date of manufacture. This covers any malfunction of the instrument due to any defects in manufacture under normal use. Your instrument will last longer if you use it often. This is due to the nature of the lubricant in the bearings. When the instruments are stationary for long periods of time, the lubricant may pool and seep-out of the bearing housing. 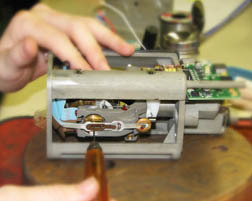 Frequent use keeps the lubricant evenly distributed throughout the bearing and increases the life of the instrument. Defective bearings cannot be re-lubricated and require a replacement. We highly recommend that you run your instruments for at least 5 minutes once a month. Kelly Manufacturing Company is an FAA approved repair station. We do all warranty repair and service on R.C. Allen instruments only. with the best service possible. Why trust your repairs to anyone but the original manufacturers? FUNCTIONAL TEST ONLY: 3 month warranty. Prices vary with type of repair so please call first. If you require an 8130-3 Airworthiness Approval Tag, you must request it at the time of purchase. We cannot, by law, issue Certificates once an instrument has left our quality control system. All serviced TSO'd instruments receive an 8130 "Return to Service" Certificate. The DMIR staff at Kelly Manufacturing Company will be happy to answer any questions you may have. Ship items in original containers if possible. Please include the following information sheet with your order. -Cap all air vents on vacuum instruments. -Do not cage attitude indicators. -Include at least 2 inches of packing on all sides. -Place instruments face up in box if possible. We are dedicated towards Total Customer Satisfaction.